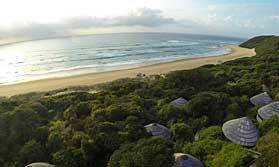 Thonga Beach Lodge is set on the pristine shores of the Maputuland coast, KwaZulu- Natal. This 24-bed luxury lodge is the ideal place to discover one of the most unspoilt wilderness beaches left on the African continent. 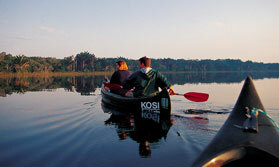 Mabibi is a magical place of coastal forests, grasslands, bush, shimmering lakes and exquisite sandy beaches. Its crystal clear, warm waters offer excellent snorkelling and fantastic off-shore scuba diving. Set above a secluded bay and just metres from the beach, Thonga Beach Lodge is nestled into beautiful coastal dune forest with sweeping views of the beach below. The thatched bush suites provide guest privacy and were carefully constructed to ensure minimal impact on the environment. Thonga Beach Lodge offers luxurious accommodation and mouth-watering meals served on an expansive wooden deck. The spacious, thatched suites are hidden in the coastal dune forest and raised on wooden stilts to ensure no harm comes to the sensitive dune soils. They have been constructed to ensure minimal impact on the environment. Some offer sea views, whilst others are set within the dune forest. All have private balconies and air conditioning. Luxuriously decorated, the rooms exude a romantic ambiance. Bleached wood, glass and natural materials have been wisely used to create an open, airy feel. The en-suite rooms have a bathroom with bath, shower and twin vanity. Location: Situated on the pristine shores of the Maputuland coast. Rooms: 24 luxury thatch suites raised on wooden stilts. Activities: Many people come to Thonga simply to relax by the beach. It's on a beautiful stretch of wild coast. If you don't want to sit on the beach itself, try the beach deck with loungers. you can also enjoy the 2 swimming pools (not huge but you can swim) which have loungers and sunshades next to them. For more relaxation, go for one of the many spa treatments offered here too. In addition you could take a sundowner trip to nearby Lake Sibaya, a nature walk with a gide, walk the dunes or long stretches of the beach, or make use of the marine centre with its equipment for snorkelling and diving. 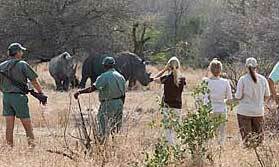 Facilities:The lodge offers a large thatched dining area that opens on to an expansive wooden deck. A cosy fireplace and comfortable couches make up the lounge area and the lodge has an ocean bar where cocktails are served. There is also a swimming pool where guests can relax and an en-site rejuvenation centre. Dining: Meals are served on the dining deck or on the beach by candlelight. Health: This is a low-risk malarial area. Communication: There is no mobile reception, phone or fax. Limited internet access at at main lodge. "The sound of waves crashing onto the wide empty sandy beach is the permanent backing track of this lovely luxury beach lodge. The beach is surprisingly little used as a spot to stop for long, as there is a beach deck with loungers, and two swimming pools too. However it's wonderful for long walks and the occasional invigorating swim. The rooms are well-done, the food is excellent and varied, and there is a good spa too. A few days here could not help but make you smile. It did me!" "Cant fault it. Loved every minute. But its not a good snorkelling venue. You either need to go a few kms out in the boat or in the rock pools which have some strong currents running through them."